A common bagel topping, smoked salmon is made by cutting the fish into strips, curing it in a brine and smoking it for flavor. Although it has nutritional benefits and drawbacks, smoked salmon can be part of a healthy meal if you consume it in moderation. However, always buy it from a reliable vendor, eat it before its expiration date and keep it properly refrigerated. 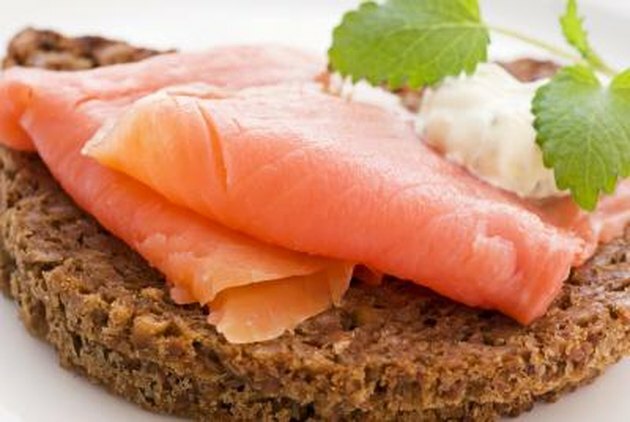 Smoked salmon is a good source of protein, with more than 15 grams in each 3-ounce serving. It also contains B-complex vitamins, as well as vitamin D, magnesium and selenium. While this size serving contain 3.67 grams of fat, the majority comes from heart-healthy monounsaturated fats. Salmon is also a good source of omega-3 fatty acids. Despite its rich nutrient profile, smoked salmon also delivers a significant amount of sodium, as a 3-ounce serving contains approximately 570 milligrams. The daily recommended limit of sodium ranges from 1,500 to 2,300 milligrams, depending on your age, race and health. Additionally, smoked fish runs the risk of carrying Listeria, a bacteria that’s not destroyed by the smoking process and can cause a rare, but serious and severe food poisoning, particularly in pregnant women, the elderly and those with weak immune systems. The Globe and Mail: I Enjoy Eating Smoked Salmon. How Healthy is It?